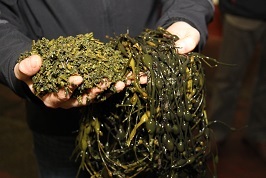 However, among these results, a lot of variability and efficiency have been observed in these effects mainly due to the great variations on seaweed extracts. 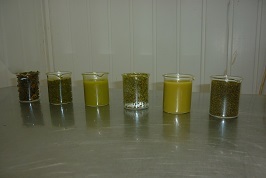 Seaweed extracts can vary from the origin of the seaweed species, the process used and the stability of the end product. All these aspects will have an influence on the results after application. 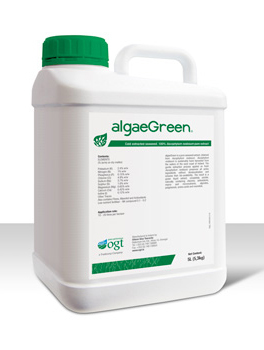 One of the main results observed with low-temperature extract AlgaeGreen, in addition to the benefits desrcibed above is, a great improvement of the plant in resisting to weather stresses such as draught or freezing. This is due to the effectiveness of the seaweed species used, Ascophyllum nodosum, the process limiting excess temperatures and the facility on feeding the plant with this 100% soluble product, either by foliar spray and/or soil applications. In this picture the fresh extract is shown. Oxidation of the extract and colour change from green to light brown is normal and does not affect the efficiency of the product.